Continuing my foray into the world of woodworking, last week I made a wooden planter box, and I’m really pleased with how it turned out. The box is functional, looks good and all the joints are nice and tight. 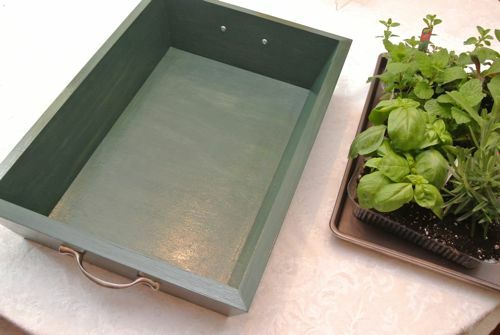 Much like the wooden beer tote I made, if you change the dimensions, this planter box can be used for many other purposes (like a casserole dish). 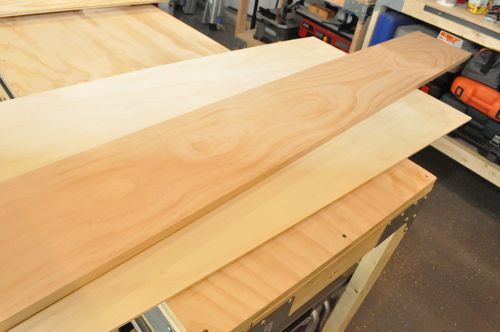 It was a fun woodworking project, and here’s how I put it together. 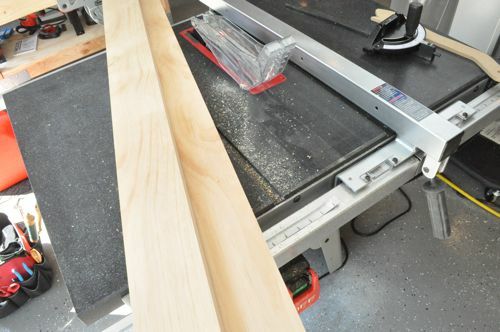 I started this project by ripping the 1 x 10″ Oak board in half on my table saw. 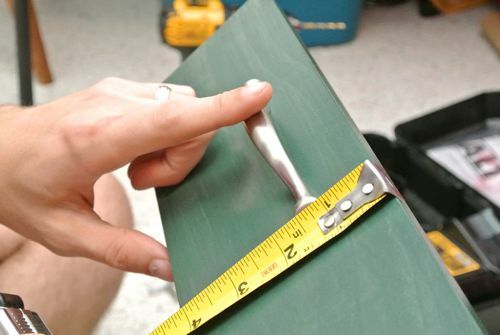 Since 1 x 10″ actually measures 3/4 x 9-1/4″, I ended up with two pieces measuring 4-5/8″ wide. 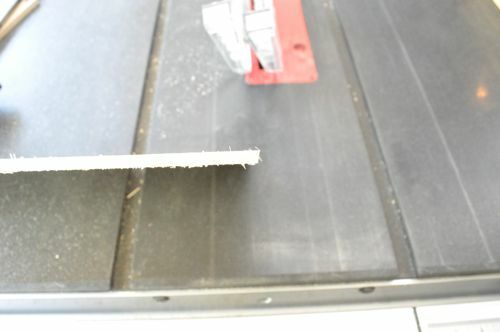 Editors Note: A few weeks back a reader noticed that I wasn’t using the blade guard on my table saw. Even though I find it cumbersome, I’ve changed my ways and use the guard and riving knife every time now. 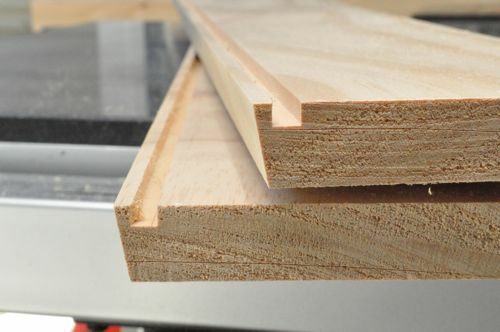 Using a 1/4″ straight bit, I routed a groove just off the cut edge (bottom) on each board. I checked the fit with my piece of plywood, and found it was suitably snug. The sides of this planter all flare out, and to achieve that, I ran the boards through my table saw again with a 10° bevel. I’ve found in the past that making all my cuts, and then testing them out doesn’t always work. 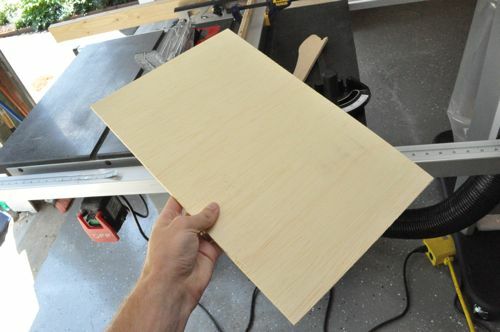 This time I cut my plywood to size (10-1/2″ x 16″) first. Next, I’ll measure the length for each side. 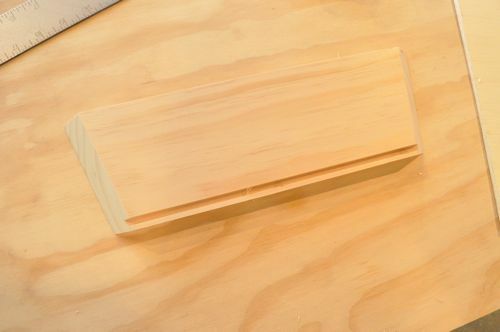 When I cut the plywood, I kept the 10° bevel, even though it probably doesn’t make much difference. I glued and pin nailed opposite corners to make it easier to fit together. 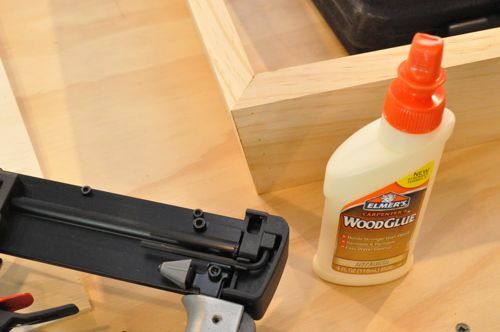 If you’ve ever worked with wood glue, you know the importance of wiping away the excess before it dries, and I used a wet paper towel immediately after nailing. 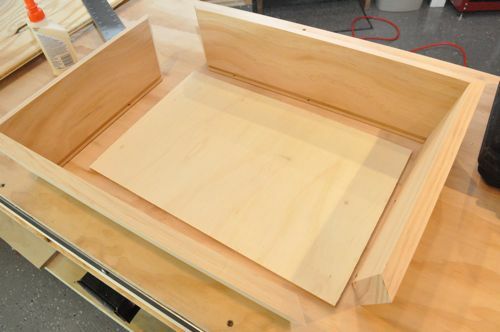 I spread glue in the corners and in the dado for the plywood bottom. Fitting it all together, I pin nailed the remaining corners. Even though the joints were pretty tight, some still hairline gaps, and I used wood filler to make the joints look perfect. Unfortunately, I neglected to take a picture of the joints after the wood filler. At this point I turned the planter over to Jocie, and she began working by sanding all the surfaces smooth with 180 grit sandpaper. Wipe with a damp rag to remove dust and debris. 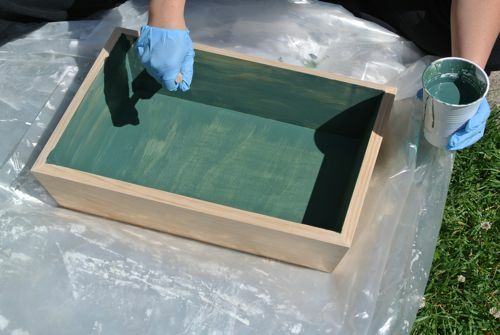 We had some tinted wood stain from a previous project, and Jocie mixed some of the yellow and blue to make teal. She applied two coats to give it a nice, uniform look. 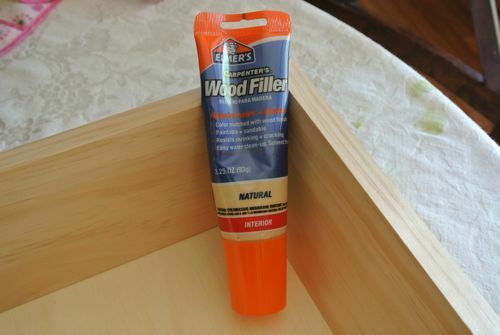 To protect the wood, Jocie applied two coats of urethane. 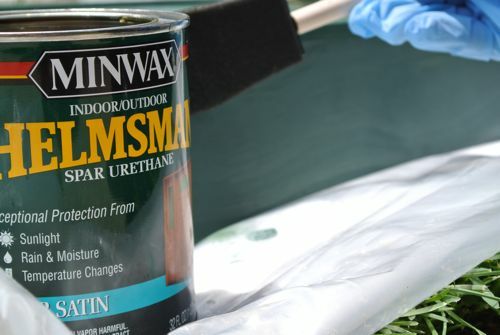 Lightly sand in between coats so remove dried, excess urethane. 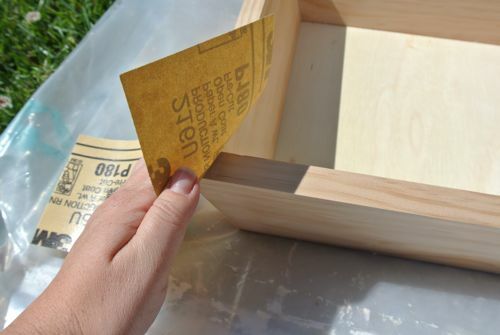 If sanding, wipe clear with damp cloth (not a paper towel which will leave remnants). 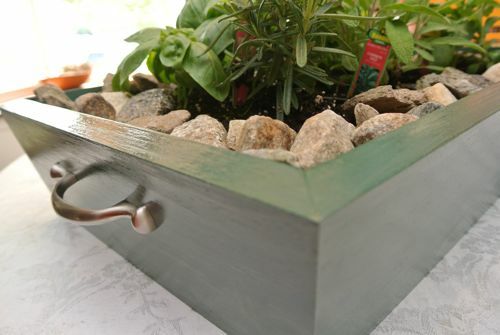 Jocie wanted handles for he herb garden so it can be used year round and brought in to a sunny window when its cold. Jocie picked up some cabinet pulls, and I installed them centered on the short sides. These are bottom of the line, Walmart cheapos, but you could certainly fancy it up with more decorative handles from your local Big Orange. 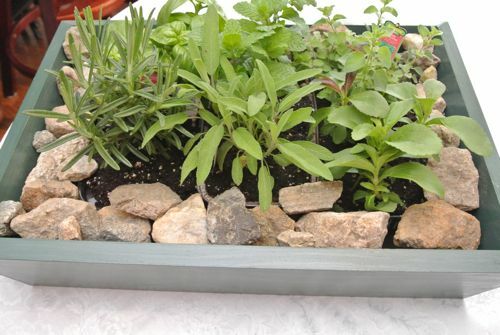 Jocie put all the plants on a baking tray to further protect the planter from dirt and water. 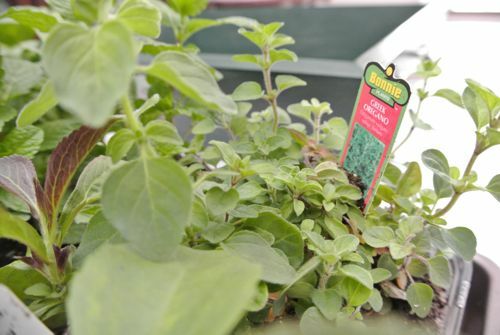 Jocie bought six different herbs for the planter: Oregano, Sage, Mint, Basil, Stevia and Thyme. She doesn’t know much about herbs but thought these we good cooking basics, except Stevia which just seemed a fun addition. Izzie, Lucy and I went on a walk through the neighborhood to find some medium-sized rocks. We brought home a bucket full and cleaned them off with the hose. In this picture you see Jocie organizing them around the plants. 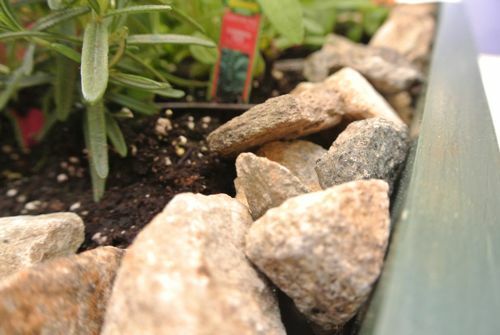 The rocks add a good bit of weight to the planter, but it is definitely sturdy and still easy to carry. I think the planter looks darn good, and I’m proud of the finished product. Jocie’s next in the line of few and far between gardening projects will be using using succulents in a wreath – its a super cool way to display plants and add decor! If you love crafty projects and home decor, head on over to OPC’s The Better Half to see what Jocie has been up to. Also, don’t forget to check us out on Facebook and Pinterest! Good work on the box. Looks nice. I’ll look again, but i think i missed the part where you set some holes for the water to drain? We didn’t put any holes in the planter itself. Each plant came in a separate container and those have holes. However, the last thing I want is water sitting against the wood. That’s why we added the baking tray. Are there any coatings made that could be used for the inside of this? I have some window boxes I made for the front of our house out of cedar but not sure what to line them with. I’ve made a few planter boxes out of cedar. 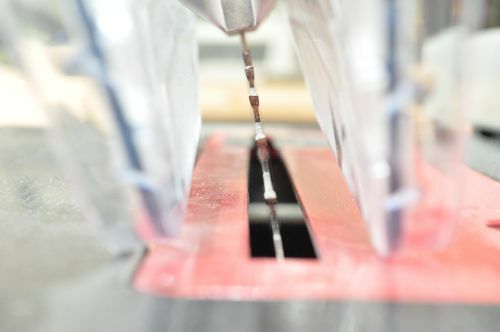 We line with plastic, then drill a few 1/8″ holes through the plastic and the wood at the bottom for drainage. Haven’t had a problem yet with rot, etc. 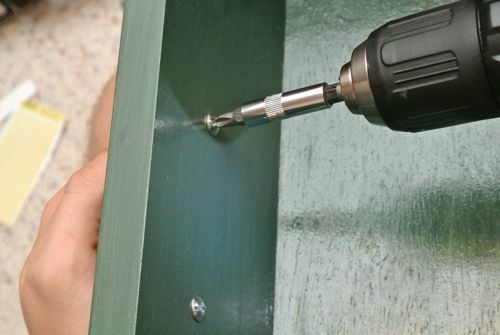 This is the same way that I build parts bins for my garage shop cabinets (minus the pretty teal paint). This way I can slide them in and out easily. Great project idea, thanks for sharing! very nice project. I think I have something to do this weekend! 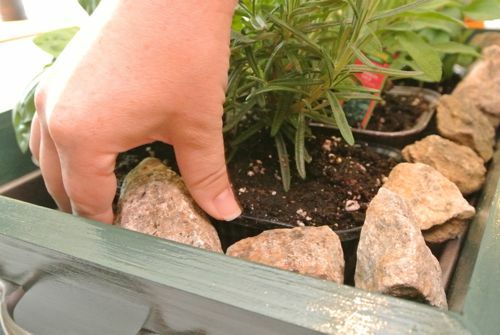 Over-watering might lead to some wood rot, but that’s a nice- looking planter. What a great tutorial! If only I had some power tools. 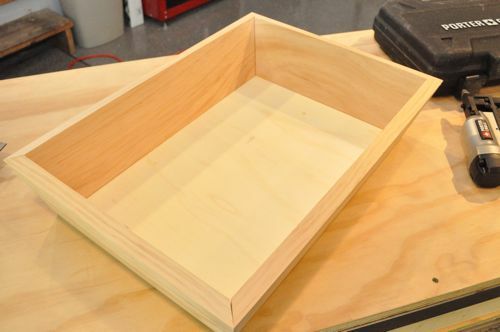 Seriously, it I could get my hands on a table saw I think i could make this using your tutorial. And using it as a plant container is fabulous. … so happy you shared at our Great Outdoors link party! This looks awesome. 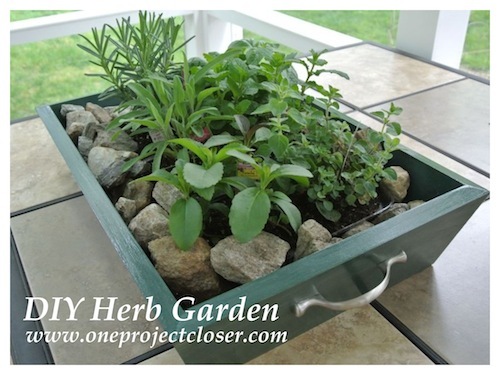 I have been wanting to start an herb garden again after mine fried a couple summers ago, and this planter is just so neat looking, so I’ve pinned it in case I have some time to make it. 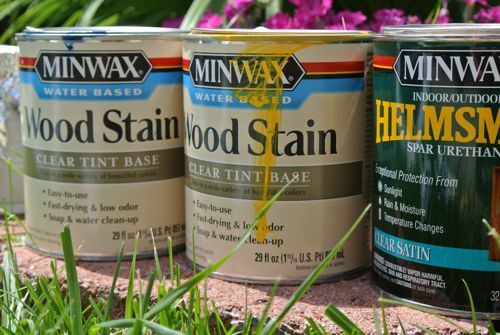 I’m always a fan of mixing two stains in order to get the perfect color I was looking for. Great job, you guys. The planter looks great. I love planting for my home. I like to spend time watering plants and cutting them in shape. 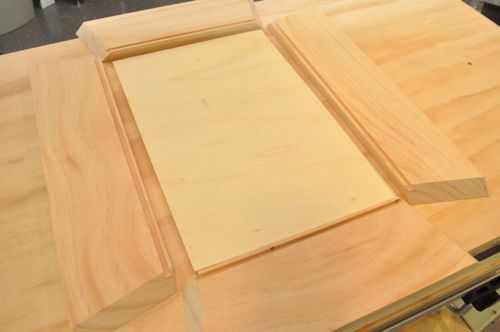 I love your tips for making wooden plant box. It is looking so fantastic. Brilliant. 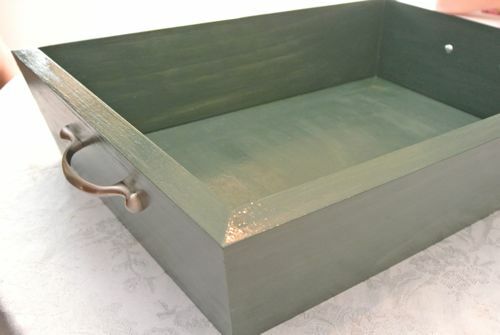 I have just finished making my second plant box. I have them both at one side of my patio area. This is a realy easy step by step process and I have recommened it to a few of my friends. The bottom in beveled, but the dado is not. You didn’t have problems fitting the plywood in? Extremely creative. I love this. It’s such a good and easy to follow tutorial. 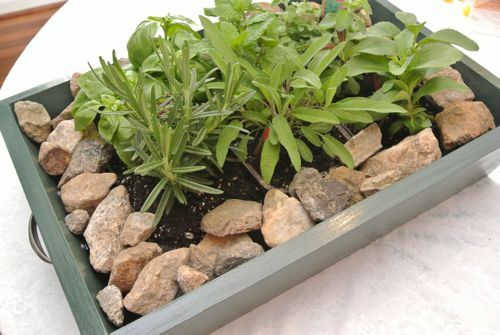 I can’t wait to create my very own zen-like herb box.